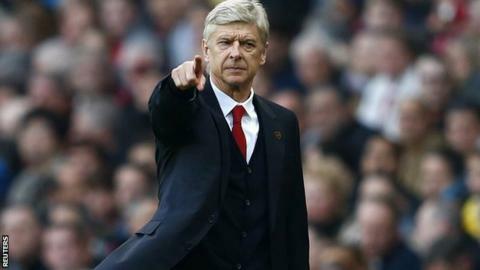 Arsenal boss Arsene Wenger wants strong financial fair play (FFP) penalties as Uefa considers action against Manchester City and Paris St-Germain. European football's governing body says nine clubs remain under investigation. "Negotiations between clubs and Uefa are at a sensitive stage. "It is not known how many of the nine are still seeking settlements but if agreements are not reached by some stage next week then the clubs who haven't accepted a deal could be referred to an adjudicatory committee. "That panel includes two European Court judges who have already demonstrated they will issue tough sanctions by banning Malaga from competing in Europe last year. "The fact negotiations between clubs and the European confederation are continuing would suggest that perhaps some unpalatable sporting sanctions - such as restrictions to Champions League squads - have been offered to some or all of the clubs in breach of FFP." Uefa could offer settlements to clubs which involve a mix of financial and sporting sanctions, possibly resulting in some having limits placed on their Champions League squads next season. "If the rules are not respected, we will feel let down," said Wenger. On Friday, Uefa said that of the 76 clubs asked to submit more information relating to the FFP rules, examinations will continue into nine of them. "From that group, the examination as regards 67 clubs has come to an end and continues only in relation to the nine remaining clubs," said a statement. "Further information shall be provided once this process has been completed." The clubs were not named, although Manchester City and PSG are understood to be two of them. The underlying aim of the rules is to ensure that over the long term clubs only spend what they earn, while also ensuring that they pay their taxes and debts on time. "There are rules to apply for the financial fair play. If you don't respect them, you have to apply the rules," said Wenger. "One of the rules is that normally you should be banned for the excess of the financial amount that is not justified, that is if you are £100 million overboard, you should be punished for £100 million of your wages bill in the Champions League. "I want to see that respected. If that is not respected, then the financial fair play will have problems to be respected in the future because everyone will just not consider it at all." No club is expected to be excluded from the Champions League for breaching the spending limits and Wenger believes that could be linked to TV rights sales. "When Uefa sells the rights of the Champions League to a French TV station, it is very difficult to explain to them once they have paid the money that the best club in their country will not play in the competition, so that might be one of the reasons behind that," said the 64-year-old Frenchman.